“So long as there is clan, there is hope.” (Page 174). Chavali is the clan seer. When her wandering clan, the Blaukenevs, stop for a carnival, she is a fortune teller for the night, telling people what they want to hear. She may not be able to tell the future, but she has the ability read people, from their expressions to their very thoughts. At times she experiences accurate prophesies and is a limited telepath, though neither are under her control. She is held in high esteem, but also regarded as one apart from the bonded clan. When she is held at knife point, her guard must save her. When the clan is under attack, who will be there to save her? 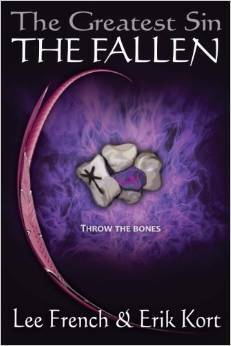 The Fallen is a novel that has been greatly imagined by the author. It is not just a world that Lee French built, but a culture and a people. French begins the story with the beginning and the Creator and then moves so far forward in time that the myth of the Creation is not thought of the same by all the inhabitants of the world. French makes her own Creation and interweaves the present day story throughout the trail left behind by the Creation. I really enjoyed the mythical adaptation feel that this story had and that French kept going back to it to create a tightly woven story that was intricate and fully fledged. The concept of ‘Clan’ French created reminds me of the close-knit culture seen in the movie Brother Bear or the strong connection of a small town where everyone knows each other and they speak their own slang. French’s clan, the Blaukenevs, do in fact speak their own language known only to them. They have their own traditions and ways of life. These rituals were fascinating to read about and they were presented as part of the way of life, intriguing to the reader and not confusing in that they were foreign. It was like being privy to a new culture by being on the inside. Chavali also presented the reader with an outsider’s perspective when she is in the outsider’s world, which I really appreciated because it was neat to see the outsider looking in perspective for an entirely different culture that French created in the Fallen society. The reader was able to get a complete picture of the new and interesting Outside world through Chavali’s eyes and it was refreshing. French described the new and different society in a way that kept my attention through every differing detail. Chavali was a fascinating character who maintained her mannerisms within her society of the Blaukenevs and throughout the Outside world. She was a no-nonsense character because she was born into an environment that allowed her to grow as a confident person. It’s neat to find a character who is strong without reason and she maintains her independence throughout a dependent clan culture as well as when she is thrust into the chaos of the Outside world. This novel was published by Tangled Sky Press on January 26th, 2014 and is available on Amazon here.